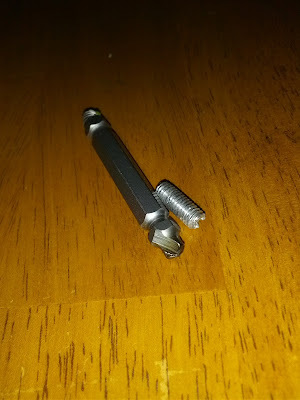 The 4mm allen key is the most important tool any cyclist needs to own. Next to, of course, the 5mm allen key. It's amazing to me how much of a bike can be built with just those two tools. Still, as I gradually improved my bike maintenance and building skills, other tools started filling my pegboard: bottom bracket wrenches, chain whips, cassette lockring adaptors, cable cutters and most recently a 32mm flat headset wrench for the King headset on the Colnago. I spend this weekend thinking about these tools because I had time on my hands for what felt like the first time in months. My little fleet of bikes, the aforementioned Colnago, the Green Monster, the frankenstein touring bike (post coming soon), and the hipster rocket (also coming soon) were all in need of some maintenance. Nothing major, but just the litany of little minor things that accrues over months and years of use. The Green Monster is my race bike and is equipped with a full Ultegra 6600 gruppo. I've been giving some thought to upgrading at least the levers to Ultegra 6700 so that I could run the shift cables under the bar tape for a nice clean look. But, as I slowly worked on replacing its worn out shifter cables I realized how convenient it was for my race bike to have easily replaceable external shift cables. It was a revelation that wouldn't have come to me if I hadn't spent 30 minutes cutting housing and then making small adjustment cuts to get the cables to flow just right. I also found a use for a broken broken screw extractor (not a typo) in removing the remnants of the bottle cage bolt front the Green Monster. It had been stuck in there for more than a year and had resisted several previous attempts to remove it. To get around having only one bottle cage bolt, I had used a zip tie to hold the other end of the cage down. It worked fine, but didn't look great. 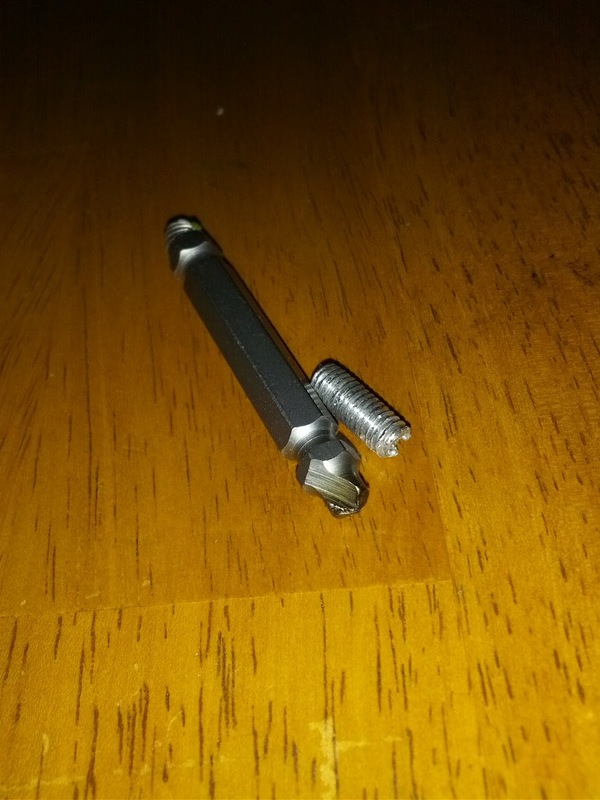 I honestly had no idea how I was going to attack the problem, but the idea to use the broken extractor with a power drill spinning counterclockwise very slowly sort of occurred to me as I stood there staring at the broken end of the bolt sunken into the frame. It was a pretty amazing feeling when the bolt started backing out. I guess the broken end of the extractor got just enough purchase on the bolt to start backing it out. I also installed a rear rack on the touring bike. The search for a disk compatible rack for the mongrel was a difficult one, but in the end the rack installed just fine over the custom rear fender fabbed up by the awesome guys at Durham Cycles before I moved. I'll include pictures when I profile the touring bike, but needless to say, it finally looks touring-bike-ish now with the rack installed. The hipster crotch rocket still needs a new bolt for the seatpost binder and the touring bike needs new brake pads on the rear but aside from that, I think I took care of everything else. 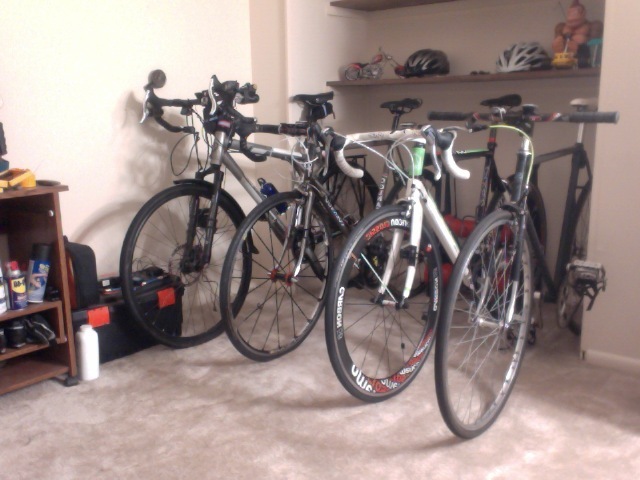 My little fleet of bikes. Anyway, these are the things I found myself happily doing over the weekend. I find the task of bike maintenance to be a very soothing activity. Bikes, lacking any sort of combustion engine, work in a purely kinematic regime. To me, this makes them very appealing to work on. There's no mystery, no black magic (although some mountain bikes suspensions and this newfangled electronic shifting malarkey are certainly more black magic than other parts). If you're methodical and careful enough, and carefully and logically think through the situation, almsot anything on the bike can be repaired. Because of that, working on them is a very peaceful experience. I've been doing it for so long that I rely as much on muscle memory as I do on conscious thought. Often, it's not until I've finished a repair or overhaul that I actually contemplate the completed task. It's a very satisfying feeling, and I like that. “Bikes, lacking any sort of combustion engine, work in a purely kinematic regime.”—That's why it's better to ride a bike. Unlike the engined one, kinetic power is what make these bike going. The more miles that it traveled, the more stronger that it gets. And the stronger that it gets, the more you should maintain its wellness.